Why yes, this is a recipe for head cheese. But don’t you think the French fromage de tete sounds sooo much better? A few years back I wrote about the Italian version of this lovely luncheon meat, coppa di testa. I love that recipe, but it requires an expensive beef casing to make, which you can only get mail order. 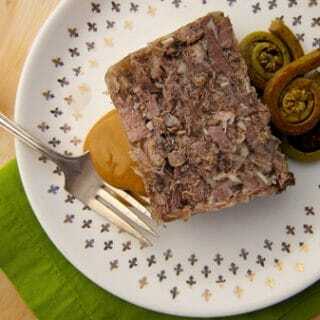 I knew then that the easier way to make head cheese is to put it in a loaf pan. But for whatever reason I waited several years before doing this again, intending to make use of said loaf pan. I also didn’t want to just re-do my old recipe, which works really well. So I decided to go the French route and make their version, fromage de tete. That version is always in some sort of pan, and I happen to own a pretty Le Creuset enameled terrine pan so it seemed like a natural. All I needed was a pig’s head. That chance came last week, when I got a chance to hunt pigs again, and ended up shooting Mistah Brown the Boar in a wild hunt. So I toted home his head along with everything else. On the drive I debated whether to make this recipe or to delve into the mysterious world of scrapple. The French won out this time, so scrapple will have to await my next pig’s head. Once you have a wild pig’s head, your job has only begun. Now you need to skin it, which is always gnarly. Yes, you could in theory scald the head and scrape all the hair off, but I shudder to think how unpleasant that task might be. I actually have an inkling, because I did just that with the ears. Why bother? Well, pig ears are pretty good eating once you clean and braise them, but I really needed the ears for the collagen in them: This helps set the fromage de tete. Yeah, I could have gone and bought some pig feet, but I didn’t feel like it. When it was all said and done, I have to say this is a damn good head cheese. I am often pretty put off by some versions, which rely heavily on an iron-like gelatin to hold them together. There is a certain rubberiness to these versions of head cheese (many of them German) that I just can’t abide by. This version, however, is really close to a rough country pate: The collagen certainly holds it together well, but it’s not really very noticeable. What you notice is a richness, a silkiness and a meatiness. Despite all the herbs and spices in this recipe, you really don’t pick up on them too much, although you would notice their absence. My fromage de tete is a meat bomb, though, make no mistake. Just like my English duck pie, it’s tough to eat a whole slice without the aid of either mustard or horseradish and a few pickled things alongside. Combined, though, it’s perfect. And yes, I know that’s more than four. Blame the French. This recipe may sound like a big pain, but it really isn't that hard. 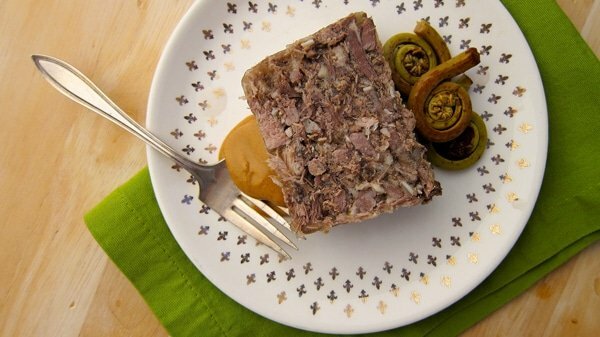 There is virtually no technical skill necessary, although it will take you a full day to make your head cheese. Do it in a weekend, and you will have lunch meat for the following week. I also love a slice of fromage de tete while watching television, served with homemade mustard and various pickled things, with a piece of good bread and a beer nearby. Now that's my idea of a good TV dinner. Once your pig head has been skinned, or is otherwise ready, put it in a large pot and cover with cool water. Add the ears if you have them, or a pig's foot or two; you want these appendages because they add a lot of collagen to the broth, which helps everything set later. Turn the heat to medium-high, cover the pot and bring it to a simmer. Skim any scum that floats to the surface, then add all the herbs and spices and vegetables. Pour in the vinegar, too. Simmer this very gently -- the surface should just shimmy rather than boil -- until the head basically falls apart. Definitely 3 hours, and probably closer to 5 or 6. 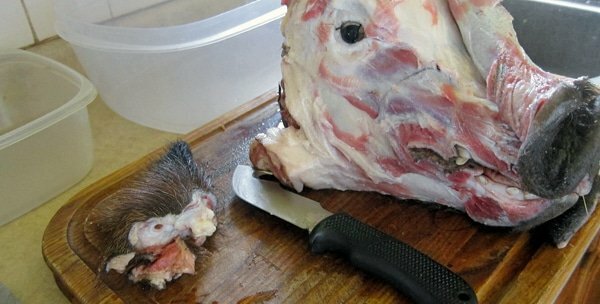 Now you have the awesomely fun job of picking everything off this dead pig's head. It's actually kind of a pleasant surprise to see how much actual meat is on the thing, but remember you also want fat and some cartilaginous bits, too. My rule: The weirder it looks, the smaller it gets chopped. Cheeks and other bits of meat I chop rather roughly, and the tongue -- after it's been peeled, of course -- gets cut into the largest pieces of all. I generally toss stringy tendons, the eyeballs (although the fat behind the eye is awesome), the palate, and any random bits I can't really identify. Put all this in a bowl and add the quatre epices. Mix well and turn your attention to the broth. Take about a quart of the broth, strain it and put it into a pot with the wine. I used vermouth here, as this is a French fromage du tete. Boil the crap out of it until the liquid reduces by a little less than half. Put all the meat and such into the pot. Now you add salt -- finally, right? You may need a solid tablespoon, but start small. Taste the mixture: You want it to be a little salty and slightly acidic. Add some more red wine vinegar if you want to; I added about 2 tablespoons. Simmer gently for another 15 minutes. This infuses all the yummy bits with the collagen-rich broth. 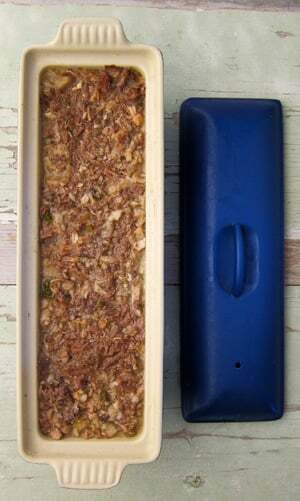 Remove all the yummy bits with a slotted spoon and pack into a loaf pan or terrine pan. Make sure it's nice and even in the pan. Pour enough of the reduced broth to fill any crevices in the fromage, plus enough to pool just a little on the top of the meat. Now cover the fromage and let it chill in the fridge overnight to set. Eat with mustard and pickled things. Sauerkraut and bread are good combinations, too, if you want to be more Germanic -- remember Alsace-Lorraine is basically a hybrid of the two countries if you are worried about feeling authentic. Covered, the fromage will keep for a week to 10 days. It does not freeze well, however. You can do this with any large animal's head, including fish. I've done it with the heads from doe deer -- antlers can be tough to fit in the pot -- and I see no reason you can't do it with lamb, goats or calves or whatnot. You can find all sorts of recipes for cured and smoked meats and fish, right here on Hunter Angler Gardener Cook! I got a cow elk last Saturday. I really want to try a fromage with her head. However, I’m guessing the head probably weighs over 20lbs (best guess is 25lbs, without putting it on a scale). Whatever it weighs that head is significantly larger than a boar’s head. How, approximately, should I scale up the rest of the ingredients to keep it in proportion? Any suggestions or alterations for using a bear head? Heather: Fascinating! Let me know how it turns out. Only thing I might add would be a couple pig’s feet for extra collagen. You can get them at Latin or Asian markets. 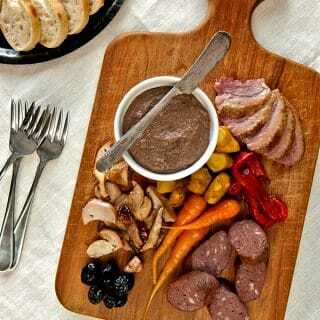 I love this recipe and tried it for our Halloween dinner party, adding a pig trotter for extra collagen. It was very well received, accompanied by a tangy sauce ravigote. So much so that I wrote about a blog post about it, linking back to your recipe. I hope you don’t mind me sharing!